The Knights of the Krewe of Cavaliers is a social organization, based in the Tampa Bay area of Florida, of like-minded men and women committed to bringing friends together for the mutual enjoyment of the fellowship offered. The Krewe supports various organizations in the community and provides warm camaraderie and fine entertainment. It was founded in 1984 by Donald Severance and a group of friends. For many years the Krewe was the largest private supporter of the Tampa AIDS network. The Krewe has sponsored formal balls, costume parties, DecaDances, and many other activities in the area. Today the Krewe serves as a social organization that participates with other local Krewes in the annual Tampa Gasparilla celebration, as well as numerous private events. 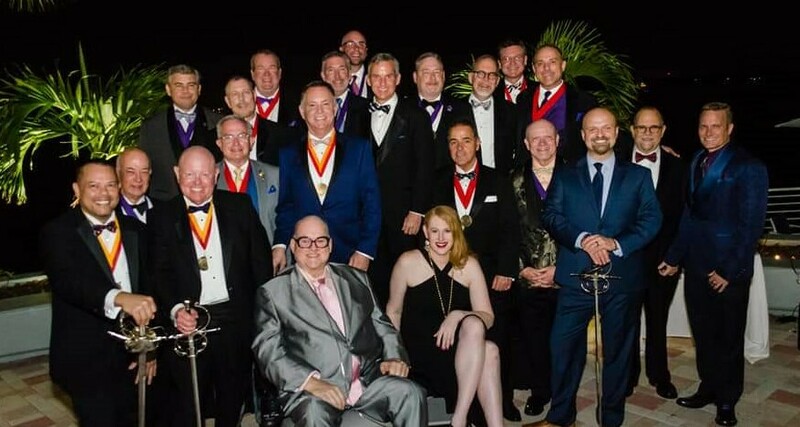 At present membership in the Krewe is limited to 40 Knight Preceptors (entry level and active Knights) but has other distinctions including Knights Emeriti and Courtiers which greatly enlarges the overall participation. Membership is by invitation only. The Krewe holds monthly Conclaves, as well as numerous special events throughout the year. If you have an interest in joining the Krewe of Cavaliers, please click the Membership Info button at left and follow instructions for contacting us.